-.' A.E.Aubin Company-Vibratory Tumbler manufacturer for finishing small parts. This popular, low-cost vibratory tumbler is a favorite of the hobbyist and is used commercially as well. Holds 25 ring castings with media, or will process about 4 lbs. of rock. Bowl diameter is 8" with new convenient solid lid system. Shipping weight: 7 lbs. 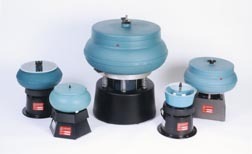 The industrial vibratory tumbler,Model TV-10, has a heavy-duty drive and suspension combined with a tough, cross-linked polyethylene bowl. Machine comes equipped for use with the FT-20 Compound Rinsing System. Capacity of bowl is .10 cu. ft. Not recommended for steel media processing. Machine bowl is supplied with noise dampening cover and liquid drain. Machine weighs 16 lbs. and has an overall height of 16". The vibratory tumbler, Model 25, has all the features of larger machines. A popular size for small production lots, the AV-25, when used with the FT-20 Compound Rinsing System, accomplishes a myriad of applications. Designed with a heavy-duty drive and suspension system and additional adjustable amplitude. Machine bowl is equipped with noise dampening cover and liquid drain. Machine weighs 27 lbs. and has an overall height of 16". When steel burnishing is required, use Model 25SS. The model 40, vibratory tumbler, is a compact machine yet has a capacity of .35 cu. ft. It comes equipped with amplitude adjustment, inlet and outlet ports for compound rinsing systems and a heavy-duty, cross-linked polyethelyne construction bowl. Sound dampening covers are standard. The Model 40 is also offered with the quick, convenient Tumble Dump feature (Model TD) for ease of unloading. When steel burnishing is required, use Model 40SS. The vibratory tumbler, Model 40SS, is specifically designed for use when steel or stainless steel media processing is required. Machine incorporates all the features of the standard Model 40, except the Model 40SS is equipped with a discharge port for easier unloading. Capacity of steel/stainless steel media: 100 lbs. All media can be used, in addition to steel and stainless steel. The vibratory tumbler,Model 75, is a full .75 cu. ft. capacity vibratory machine that offers increased productivity over other models. The machine is equipped with a heavy-duty drive system that includes convenient amplitude adjustment. The Model 75 also includes the same features of the Model 40, including the Tumble Dump feature (Model TD), for fast, easy unloading. Cabinet Construction: 14 gauge formed, reinforced and welded steel; complete sound insulation with cover to keep noise level below 80 db. Tub Construction: Continuous welded tub of 11 gauge steel with one-quarter inch steel angle reinforcements; 80-90 durometer urethane lining of one-half inch minimum up to one inch in wear areas; 5-inch urethane discharge chute; easily changed 2.5 x 5-inch drain. Drive System: 1-inch steel shaft with high energy counterweight; heavy duty bearings for continuous use; quick change amplitude; enclosed shaft housing; vibration absorbing, self-aligning belts. Electrical System: 1 hp motor; 3450 rpm motor allows for use of a high-energy shaft to impart greater action to the tub; water tight cord connection; water tight electrical box; single phase. Internal Compound System: Self-contained recirculating system, which cuts down on water usage and waste disposal; easily converted to permanent installation with room underneath for plumbing for full flow-through operation.